Red meat is a term that came from a culinary industry. It refers to all meat that is red uncooked and does not appear white after being cooked. The common red meats being consumed in western part of the world are beef, lamb, goat, horse, goose, duck, pork and other livestock animals. When red meat is consumed in moderation, it is beneficial to health. Most claims that advice against even small amounts of red meat consumption and assert it as being dangerous for health are misleading and far from the truth. There is no consistent evidence that the fats from red meat significantly raise cholesterol levels above the normal limits, cause a coronary heart disease or result in cancers from unprocessed meats. As an example of current red meat consumption controversy, a study from Harvard School of Public Health demonstrated that people who ate skinless chicken most days of the week had a 52% higher risk of acquiring a bladder cancer. On the contrary, those who consumed chicken with skin and had a variety of red meats in the diet were less likely to be affected. Another 191-person study with those who had high cholesterol had defined 2 groups with one group consuming at least 80% of their dietary intake from red meats and another group consuming strictly lean white meats. The results of this study funded by the National Cattlemen’s Beef Association demonstrated nearly identical triglyceride and cholesterol levels in both groups. This particular study suggested that lean red meat may be potentially beneficial in low-fat diets to treat high cholesterol. With consistently growing deficiencies of vitamins and minerals that our bodies require to function, the livestock meat is considered an essential element of the food chain. 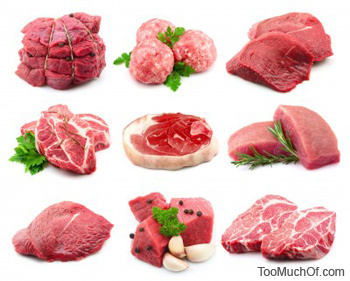 Red meats contain some of the most important vitamins and minerals. Without these nutrients, people become sick more often while making a very faint connection to the actual deficiencies they create by their limited daily diet. This can be clearly demonstrated by following endless number of reports that vitamin B supplementation has been very effective to resolve a variety of ailments. Should there be no vitamin B deficiency, these illnesses would not occur in the first place nor would supplementation be effective. Red meat provides a rich spectrum of vitamin B compounds that work synergistically with minerals in the meat for great absorption and utilization. When not too much red meat is consumed, the nutritional value of this type of meats is tremendous. It provides substantial amounts of Vitamin B12 and B6, Riboflavin, Niacin, Iron, Zinc, Selenium and Phosphorus. This combination of nutrients has a natural bioavailability therefore cannot be truly replaced by supplementation. Just like with anything else, when too much red meat derived fats (in significant excess) are introduced in the diet, it may become harmful. An example of excessive red meat consumption would be a few pounds in a single week. It is important to note however, that occasional or regular but small consumption of red meats is very beneficial and essential for health. Additionally, most recent studies that accentuated differentiation between the fresh and processed red meats. These studies have failed to demonstrate a definite link between unprocessed red meat consumption and cardiovascular diseases. It appears that the processed meats after all are the reason for excessive negativity regarding the meats such as beef, lamb, pork and other red meat types.